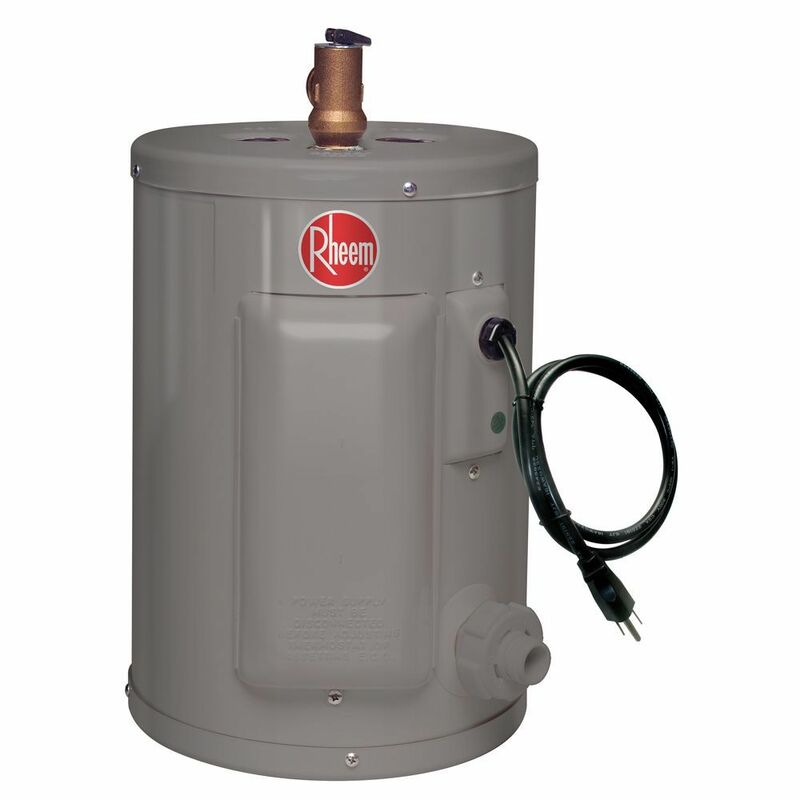 The Rheem Performance Line. Exclusive to the Home Depot! A 2 gallon electric point of use water heater, this model has a 6 year limited tank and parts warranty plus a 1 year in home labour warranty. This unit comes with a 1440 watt element and an automatic thermostat which keeps the water at the desired temperature, providing fast and quick hot water delivery. Requires 120 volt electricity. Cord included. A 1440 watt element for fast water temperature recovery. The Eccotemp 45H-LP Outdoor Propane Tankless Water Heater is the largest outdoor model of the Eccotemp tankless line. Rated at an impressive 6.8 GPM and 140,000 BTU per hour, the 45H-LP can meet all the hot-water needs of a standard home or apartment with one or two bathrooms, as well as smaller commercial applications. With an outdoor installation, there is no additional vent piping to purchase. With its fully automated control system, the Eccotemp 45H-LP is the ideal choice for any standard sized home. IMPORTANT: The 45H-LP is an outdoor unit and cannot be used during periods of freezing temperatures. The water inside the pipes will freeze and will result in breakage. Please drain and winterize before periods of freezing temperatures. Point of Use 2 Imperial Gal Electric Water Heater with 6 Year Warranty. The Rheem Performance Line. Exclusive to the Home Depot! A 2 gallon electric point of use water heater, this model has a 6 year limited tank and parts warranty plus a 1 year in home labour warranty. This unit comes with a 1440 watt element and an automatic thermostat which keeps the water at the desired temperature, providing fast and quick hot water delivery. Requires 120 volt electricity. Cord included. Point of Use 2 Imperial Gal Electric Water Heater with 6 Year Warranty. is rated 3.0 out of 5 by 2. Rated 5 out of 5 by bob loblaw from Perfect add-on to main system. We recently changed over to a tankless hotwater system for the house, which was generally okay but was too far from the kitchen. It was taking forever to get hot water there. I connected this little tank to the wall in the basement directly below the kitchen sink. The 'hot' water from the main system goes in, and out goes to the tap 3' above. Perfect solution. It gets the water really hot and is very quiet. Because the water coming in is not very cold it heats up in no time. Rated 1 out of 5 by Skillkeeper from Leaking Leaking out of bottom. Brought back to store and got other one. Leaking also out of bottom. Cold inlet not leaking nor hot out. Pex tight. Pressure relief also good. Leaks worst when water is heated. What are the Inlet/Outlet pipe fitting sizes (1/2&quot; or 3/4&quot;)?